Some lessons are never learned, or easily and quickly forgotten the moment we are seized by the manic-depressive Mr. Market. Never forget the title of the book: “Riding The Roller Coaster – Lessons from financial market cycles we repeatedly forget”. Do we really learn anything? Or we simply forget? The book was written and published much before I heard anything about Bitcoin or other cryptocurrencies. What does the anatomy of a market crash look like? To begin with, some new thing, innovation or a theory comes up. In the 1920s, it was the industrial revolution. In the 1990s, it was the Internet. Or in early 2000s, it was BRICs. Harshad Mehta offered a new theory called “replacement cost theory”. The early 2000s also saw the spread of financial innovations beyond investment banking – the use of derivatives and SPVs was more rampant than ever. To a large extent the “new” theory or innovation is plausible and easily accepted by the public. Fundamentals are strong and valuations are attractive as most bull-runs start after the bear market has ended (logically). Looking at this opportunity, smart investors jump in and start buying. This buying pushes the prices of the asset under question up. As prices move northwards, more investors start to take notice of this movement. Those who follow trends join the bandwagon. With asset prices moving up, the market value of one’s holdings moves up. This increases confidence. The increased confidence results in increased spending. Higher consumer spending improves the financial performance of companies – order books start looking better – profit margins start improving and hence the stocks look even better. This may not be visible in all cases, however, for different situations, one may be able to see the parallels. In the recent real estate boom in India, many saw the paper value of their self-occupied houses zooming. That gave them the confidence to increase either their spending or look for investment opportunities in the real estate market. This gave rise not just to new housing projects, but also to the financial instruments investing in real estate businesses. One such product was being offered by certain wealth management firms and banks – a real estate Portfolio Management Service that invested the investors’ money into bonds issued by real estate firms. If you ask any of those investors how comfortable they would be lending money to builders, they would prefer to stay away. However, when the real estate prices were only moving up, they did not wait to ask whether they were participating in the real estate market’s growth or were simply lenders to builders. With the increase in asset prices and overall positive movement in the economy, credit becomes easily available. Investors can now borrow against the security of their inflated assets. If they can, they do. Leveraging puts more money in the hands of consumers and investors. Both consumption and investments go up further. The profits of companies and the price of assets go up. With the asset prices moving up, the immediate past performance looks mouth-watering. The pledging and investment cycle is repeated again and again. More money is visible – the media joins in and that provides fuel to the fire. Most wildfires start with a small spark. Same analogy can be applied to market frenzies also. Making money looks so easy. People start getting confident and then overconfident. Overconfidence leads to creation of excesses. Risk is forgotten. Caution is thrown to the winds. People believe whatever is said and so often, they ask only to get some confirmation on what they believe. If someone has a different viewpoint, it is conveniently ignored. Tough questions are not asked. The past is extrapolated into a distant future. If only someone questioned the “eye-ball” valuation in the 2000s. What if someone did not? We learnt it later. But, did we? What about the “foot-fall” valuation of the retail malls and “land-bank” valuation of the real estate companies six to seven years later? Masses of people create a large scale Ponzi scheme or succumb to the greater fool theory. We need someone to be a willing buyer at a higher price, in order to make a profit and hope remains the only strategy. Somewhere the cycle breaks. The reason could be anything from monetary tightening or illiquidity for a brief period or some announcement or some expert’s comment on the excesses or discovery of some scam. In the initial days, many are still in the denial mode and they keep “averaging” at lower prices only to get exhausted or frightened. The crowd suddenly realises that the prices were incorrect and there is a mad rush to get out. It results in a stampede and the prices of the asset falls like a house of cards. Confidence takes a hit and people reduce their spending. Profitability of companies gets impacted. The vicious cycle – the downward spiral – begins. Regulators get active and come up with new regulations. Some villains are penalised – sometimes in reality, often symbolically. This is required. It gives an impression that the authorities would not rest till the guilty is punished. It gives an impression that after a loss, one can go to someone – some authority, who takes some action. Identifying a villain is important. It gives some satisfaction to everyone that “someone” was caught and penalized. There is a big difference between assigning blame to “something” versus assigning the same to “someone” for a calamity. Think about it! Who is a better villain than someone who has made loads of money (or someone very famous or powerful)? No, this is not about sociological ideology. Even in the United States of America, there was some solace in painting the bankers (who earned heavy bonuses during the boom time) as the chief architects of the crash. These same guys were demi-Gods during the boom. However, while they were being worshipped, they were actually sowing seeds of the destruction. Excesses are removed from the system. The price pendulum swings excessively in the other direction making the valuation once again attractive. And, we are ready for yet another cycle. What we could see was that whenever financial markets have tried to generate returns higher than the real economy, the result has been either increased cost (thus lowering returns to investors), or increased risk (which eventually manifests itself) or both. Financial markets can at most upfront the gains of the real economy. These upfronted gains then lead to pains for a long time just to restore the balance. Seeds of destruction are sown in good times. Yadaa yadaa hi dharmasya glanirbhavati bhaarat, abhyutthanamadharmasya tadaatmanam srujamyaham. Whenever excesses are created leading to unethical practices in the market, adharma sets in. The markets crash only to remove the adharma and restore dharma. History suggests that to remove the Kauravas, the epic battle at Kurukshetra was inevitable. Every boom-bust cycle leaves some wreckage as also some gems. In the mythological story, Samudramanthan gave both poison and nectar. The Tulip craze left the beautiful Tulip gardens of Amsterdam; The Internet era gave us companies like Amazon and Google. In the absence of so much money chasing these sectors, this might not have been possible. We feel it is our duty to keep revisiting these pages of history to constantly keep reminding ourselves of the follies. That is the best way to protect ourselves from the financial hara-kiri committed by crowds so often and so regularly. Well, history may not exactly repeat, but it may rhyme. This particular disclaimer is essential here since I do not know the future and this post is not written for the purpose of predicting anything. I will leave it to your wisdom to decipher the current events about bitcoin and various other cryptocurrencies, or any other investment avenue for that matter. 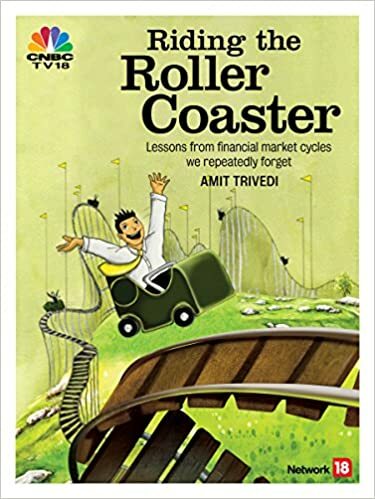 A friend has ordered bulk quantity of my book “Riding The Roller Coaster – Lessons from financial market cycles we repeatedly forget” for his clients. This would be his Diwali gift for them. During the festive days of Diwali, we pray two Goddesses – Saraswati and Lakshmi. While a book containing knowledge is an offering to Goddess Saraswati, a book on financial markets is an offering to Goddess Lakshmi.